This quick and easy Blueberry Mint Lemonade Recipe is the perfect 0 Points drink to help you feel refreshed without downing a lot of calories. The flavors in this lemonade taste best after they’ve had a chance to sit and blend a bit, so I like to make it in the morning and then pop it in the fridge til lunch. You can sweeten the lemonade if you’d like…I usually use Stevia or Splenda to keep it at 0 Points, or you can drink it as is, as the mint helps to balance out the tartness of the lemon a bit. If you choose to sweeten it with sugar, just remember to calculate the Weight Watchers Points. This is a great drink to indulge in on a hot summer day, or right after a workout or spa visit. And it’s the perfect healthy drink recipe to impress guests at your next BBQ, picnic, or outdoor party! This light and refreshing 0 Points drink recipe for Blueberry Mint Lemonade is the perfect diet and health conscious beverage to serve at any BBQ, picnic or lunch. Juice lemons into a large pitcher; add water, then stir to combin. 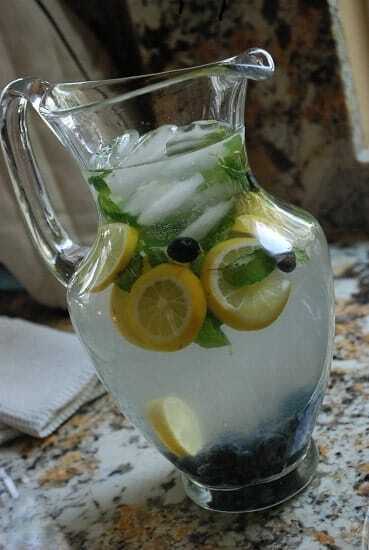 Add blueberries, lemon slices and mint. Add Stevia or Splenda to sweeten, if desired. I make these types of water all the time. We love lemon, strawberry and mint. Also strawberry, blueberry and raspberry. Today we tried mango and strawberry, its very good actually. I tried it because my mango was a bit too ripe. This what my sons drink instead of soda, fruit juices etc. Very refreshing on a hot day. My wife often requests homemade lemonade from this 1952 Joy of Cooking book I have. From making that, I can say the extra step of freshly squeezing your lemon juice instead of bottles of lemon juice makes a HUGE difference in the taste. This makes me want summer to come! I wonder if strawberries would be a good pairing instead of blueberries–I’m not that big of a fan unless they’re in baked goods. I just spent most of my night browsing your recipes and I’m super excited to try a bunch out!! Thanks for all the ideas and inspiration! Raspberry Lemonade is a classic combo, too. This sounds very refreshing!! Do you think you can blend all (skins excluded) and make a refreshing smoothie?? Mmmm…sounds like a yummy idea!! Try it and let us know how it goes!! Or you could muddle the berries a little first so their juices mix with the lemonade.